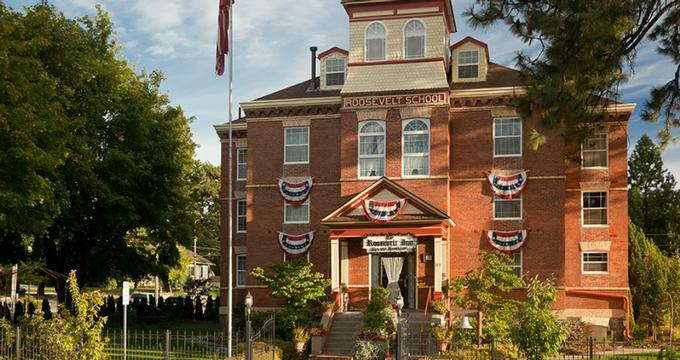 Set in a former red brick schoolhouse dating back to 1905, the Roosevelt Inn is an elegant bed and breakfast in the heart of the lakeside town of Coeur d'Alene in Idaho. Located a stone’s throw away from the shores of Lake Coeur d'Alene, this relaxing retreat features beautifully appointed guest rooms and suites with contemporary décor, period furnishings, and stunning lake views. Suites have crackling fireplaces, and modern amenities at the Inn include a hot tub and sauna, well-maintained gardens and grounds with the board and lawn games, and a comprehensive DVD library. Known for its wealth of outdoor recreation and water sports on Lake Coeur d’Alene, the eponymous city offers an array of things to see and do, ranging from museums and galleries to hiking and mountain biking trails, kayaking, canoeing, fishing, and lake cruises. The Roosevelt Inn features beautifully appointed rooms and suites with contemporary décor and period furnishings. Named after former teachers or significant people that played a major role at the Roosevelt School, all accommodations boast king or queen-size beds in luxurious linens, and en-suite bathrooms with showers or bathtubs, plush towels and bathrobes, and designer toiletries. Modern amenities include a twice daily housekeeping service, an evening turndown service, alarm clocks, hairdryers, irons and ironing boards, and complimentary wireless Internet. Standard rooms have queen-size beds with luxury linens, en-suite bathrooms with showers and bathtubs or just showers, plush towels and Roosevelt-embossed bathrobes, and designer toiletries. The Hansen/Larson and the Meyers/Emerson Suites are two-bedroom suites with queen-size beds in luxury linens, and en-suite bathrooms with walk-in showers, plush towels, and Roosevelt-embossed bathrobes, and designer toiletries. The Principle’s Executive Suite is an elegant retreat with stylish décor and sleek furnishings, a grand pillow top four-poster bed with luxurious linens, an en-suite bathroom with shower and soaking tub, and separate sitting room with full-length sofa, two designer armchairs, and a romantic fireplace. The Roosevelt Suite is a romantic and elegant abode with large windows and beautiful views over the well-maintained lawns, a king-size pillow top bed in luxury linens and an en-suite bathroom with a bathtub and shower, and a period fainting couch. Contemporary in design and décor, the Bell Tower Suite is a large and spacious two-story suite complete with a king-size bed in deluxe linens, an en-suite bathroom with a soaking tub and shower, a delightful private sitting area with a fireplace and magnificent views of the lake. A gourmet breakfast is served every morning and includes cereals, granola, yogurt, fresh fruit, juices, hot entrées and egg dishes, freshly brewed artisan coffee and organic teas. A beverage bar with wine, beer, and other drinks, along with baked treats and other snacks is available throughout the day, and a manager’s cheese and wine reception are held every evening. Upscale amenities and facilities at the Roosevelt Inn include a gourmet breakfast served every morning and freshly baked treats and a beverage bar with wine and beer for sale available throughout the day. Guests can enjoy a cheese and wine reception every evening and relax in the well-maintained gardens and grounds which are ideal for lawn games. The hotel also features a hot tub and a sauna, in-room massage therapy services, two elegant parlors with a DVD library and board games, and an array of concierge services. The hotel also offers modern event and meeting spaces for weddings, corporate gatherings, and other celebrations, as well as a business center with a computer, printing, copying and faxing services. The Inn offers a variety of special packages throughout the year, such as the ‘Top of the World Package,’ which includes a two-course sit down breakfast, dinner for two at Fleur de Sel with a limousine ride to dinner, a rose petal strewn bed, a bottle of Champagne or sparkling cider and chocolate dipped strawberries on arrival. The package also includes a 20-minute tandem para sailing experience or a 20-minute seaplane ride over beautiful Lake Coeur d’Alene. The Roosevelt Inn offers a unique and historical setting for romantic weddings and other special celebrations. Boasting beautifully landscaped gardens and grounds for tranquil ceremonies and elegant ballrooms and parlors for grand receptions, this magical Coeur d’Alene wedding venue promises to provide an unforgettable event. The Roosevelt Inn also offers a variety of exclusive packages and special services, including catering, décor arrangements, flowers, entertainment, event management and more.